Did you know that customers can choose to return products that they purchased on the Trek Bikes website to a local Trek retailer? And when they do, the process is going to be different than it is for a regular return. 2. Select the Order tab. 3. Select Consumer Returns under the trekbikes.com tab. 4. Complete and submit the Trekbikes.com consumer returns form. 5. Print a confirmation page for the customer. 6. Let the customer know that a refund will be issues to their original credit card. If the customer wishes to exchange the product for a new one, you can create a new sale for the new item, as normal. It will require a new payment from the customer (as Trek Bikes will be refunding their previous payment). 1. 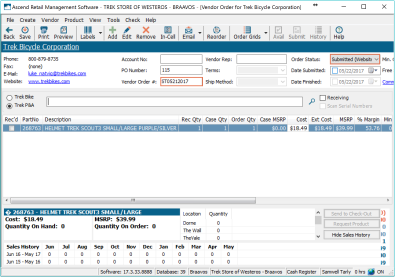 Create a Vendor Order for the vendor Trek Bicycle Corporation. 2. Add the product to the order. a. Vendor Order # field should contain the Order No from the Dexter form. b. Select Submitted (website) from the Order Status field drop-down menu. 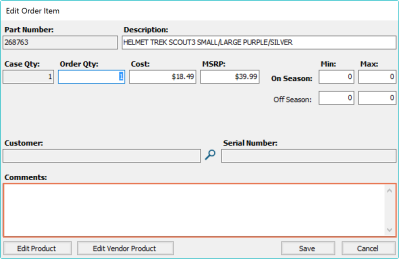 c. Double click on the item to open the Edit Order Item window. d. Fill in the Comment field with what happened. 5. Receive and complete the order.